I adored this book. Meredith is a bake shop owner who is having an unusual amount of trouble with her computer. Vlad is the tall, handsome not-geeky computer geek who arrives to troubleshoot. But Meredith’s got more problems with her business than her computer, and she’s not sure Vlad is suitably concerned. Is he around just for a romp and some cupcakes? 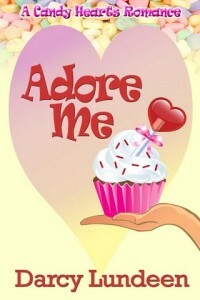 Adore Me is a rollicking good read with one of the more creative uses of candy hearts likely to be found. Highly recommend; Darcy Lundeen is an author to follow! I love the cute cover! Thanks so much for your wonderful review, Beverly. I appreciate your taking the time to read the book, and I’m thrilled that you enjoyed it.